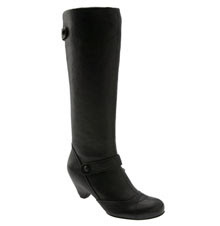 For the past several years, I've been trying to find an attractive, comfortable pair of dressy winter boots. The results of my unsuccessful experiments are about to be photographed and put on eBay (many have been worn only once or twice) or taken to Classic Consignment. The bottom line is that the ones that look good hurt like hell and the ones that don't hurt look like hell. How long has this been going on? Well, there's a pair headed for eBay that my father bought me as a birthday gift. And he died three years ago. This year I've mail ordered and returned three pairs of boots already. I've tried Nordstrom, J. Jill, Eddie Bauer, and Sierra Trading. In desperation, I occasionally pop into trendy little boutiques downtown and try on boots. God knows why. Even if I find a pair that don't have stiletto heels, bizarre elf-like toes, or jangling hardware, they don't fit. I even wasted an entire Saturday at Bellevue Square Mall looking for boots. A few weeks ago, on my way to the Seattle Art Museum, I spotted an intriguing boutique with boots on First Avenue next to the Lusty Lady (!). But I was late to meet someone at the museum, and when I got out I was rushing to meeting Zorg at REI. The next time I was downtown I was rushing yet again to get somewhere. This evening I was downtown with my friend Ellen from D.C., who has the world's most impressive shopping karma. We'd already engaged in major retail therapy at Pike Place Market Tuesday, and this evening we were doing downtown. I told her about the little boutique I'd been wondering about (Nuvo Moda, it's called) and we headed for First Avenue. When we stepped into Nuvo Moda, my first thought was that I was a bit north of their target demographic. But I went over and looked at the display of designer boots and was impressed to see quite a few that had relatively modest heels. And all of them were made of lovely high-quality leather. Then the saleswoman (wearing a stunning turquoise sundress, despite the fall weather) came over and suggested a pair of boots I hadn't noticed. I tried them on. And they were perfect. No question, Ellen is going to have to move to Seattle. Or at least come out here and take me shopping with her a few times a year. The boots, by the way, are made by Corso Como (a Brazilian brand named after a street in Milan). They are also available on the Nordstrom website. So, now I have a rain-resistant winter coat and some boots. I declare my winter shopping season officially closed.